In January, free campus shuttle service began to bring passengers from parking lots and other sites near the margins of campus to the inner core. OSU hosted the "God at 2000" conference in February. Seven internationally recognized scholars, including Nobel Peace Prize laureate Bishop Desmond Tutu, discussed the topic "How I See God" with an on-site audience of over 1000 and a national audience at over 600 locations linked by live satellite television. June commencement ceremonies were divided for the first time into separate events for undergraduate and graduate students. In July, the College of Oceanic and Atmospheric Sciences launched the 54-foot research vessel Elakha, to be used primarily for research of Oregon’s coastal marine systems. The OSU College of Engineering received a gift of $20 million in August from an anonymous OSU alumnus in its campaign to raise $125 million and become one of the top 25 colleges of engineering in the country. Martin Kelley ('50) later revealed himself as the donor. The Department of Extension and Experiment Station Communications won 13 awards at the annual meeting of the Agricultural Communicators in Education (ACE), more than any other of the 700 member organizations. In November, the Beaver football team concluded the 2000 season with a 10-1 record (its best ever) and an invitation to play Notre Dame in the Fiesta Bowl on January 1, 2001. Population in Corvallis: 50,800; in Benton County: 78,153; in Oregon: 3,421,399. In February, the Board of Higher Education awarded the new branch campus in Bend to Oregon State University. Classes at the new OSU-Cascades Campus began in September. Located on the campus of Central Oregon Community College, the branch campus offered a dual enrollment program with the community college and 20 bachelor’s and graduate degrees. The OSU Foundation created a $3.5 million endowment for student scholarships at the campus and construction began on a $5.4 million building to house most of the classes and operations of the new campus. The centenary of Linus Pauling’s birth was celebrated with exhibits, film screenings, lectures and a full-day symposium, "A Liking for the Truth: Truth and Controversy in the Work of Linus Pauling". The Northwest Association of Schools and Colleges reaffirmed the accreditation of OSU after a ten-year accreditation review in April. The report commended OSU for its commitment to undergraduate and graduate students, cited the university’s renovation and expansion of the Valley Library, and applauded OSU's commitment to statewide service and program access. OSU was directed to assess its mission and goals per its available resources and address issues relating to educational assessment, library collections, and deferred maintenance. Queer Resource Center established in March. First outdoor commencement was held for undergraduates at Reser Stadium. A separate ceremony for graduate students was held in the LaSells Stewart Center. The OSU community responded to the September 11th terrorist attacks by providing a gathering place in the Memorial Union lounge for students, staff, and faculty. Many participated in National Day of Prayer and Remembrance on September 14th. In keeping with other universities and professional sports teams, OSU’s football game on Sept. 15th was postponed. The grand opening celebration of the OSU-Cascades Campus scheduled for September 16th was cancelled. More than 18,000 students enrolled at Oregon State University’s Corvallis and Cascades (Bend) campuses in the fall, giving OSU the highest enrollment in school history. Oregon State’s enrollment for its Corvallis campus was 17,920, a 7 percent increase over Fall 2000 enrollment of 16,777. OSU’s on-campus enrollment easily surpassed its previous enrollment record of 17,689 students set in 1980. The New Media Communication Program was unveiled ten years after the popular journalism and broadcast journalism majors were closed due to Ballot Measure 5 budget cuts. The program was to be a hybrid effort taught by faculty in speech communication, English, computer science, and art. A 68-foot-high campanile, dedicated to the late H. Dean Papé ('42), was given to the OSU community by the Papé family. 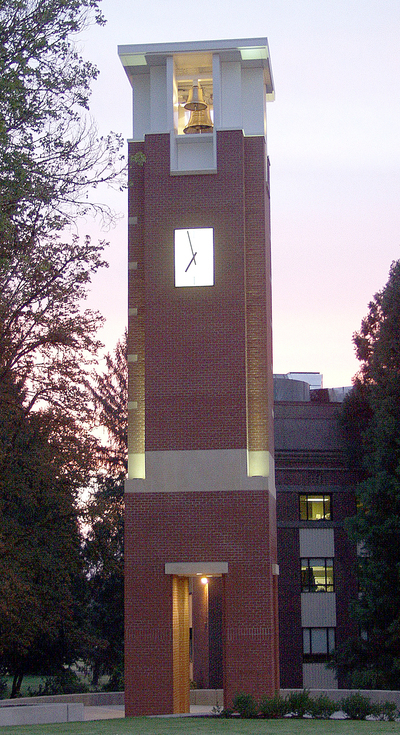 The bell tower, located east of The Valley Library, contained five bronze bells that will chime the hour and half-hour and a clock face on its west side. Papé was noted alumnus and successful Oregon businessman. A multi-million-dollar budget shortfall for the 2001-2002 fiscal year was reconciled by reducing operating expenses in non-academic units by 6.5 percent, reallocating 3.25 percent of funds from academic units, limiting hiring, and reducing telecommunication and travel costs. A $19 million expansion and renovation of the Dixon Recreation Center began in January and was completed in May 2004. It added 60,000 square feet of space to the facility. Oregon State University students and administrators sign a covenant guaranteeing support of the cultural centers in perpetuity. In March the colleges of Home Economics and Health and Human Performance combined to form the College of Health and Human Sciences. With this merger, the School of Education was re-established as a separate entity on campus. Programs in the new School of Education included elementary education, secondary education, adult education, community college leadership and counseling education, the College Student Services Administration (CSSA) program and the 4-H Youth Development program. Sam Stern was appointed dean of the newly reorganized school. The Daily Barometer was chosen as the nation’s best student newspaper in the U.S. by the Society of Professional Journalists. Construction of a Hilton Garden Inn hotel on campus near the Lasells Stewart Center began in August. The facility opened in September 2003. 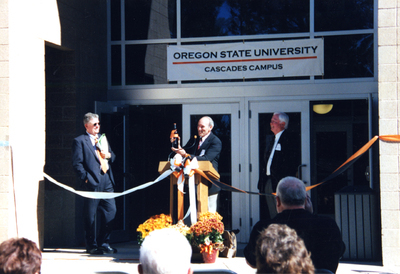 Cascades Hall at the OSU Cascades Campus was dedicated in September. OSU Distance and Continuing Education was renamed OSU Extended Campus on September 1. In November, alumnus Don Pettit (chemical engineering, 1978) began a four month sojourn aboard the International Space Station, Alpha. Pettit worked for the Los Alamos National Laboratory before joining NASA in 1995. President Paul Risser was named chancellor of the Oklahoma University System in November. The university’s first new residence hall in 30 years, Halsell Hall, opened. It was named for Carrie Halsell ('26), OSU's first African American graduate. Located near Finley and Bloss halls, it could accommodate 210 students. A climate analysis model developed at OSU, PRISM, became the national standard for climate mapping. The technology was being used by several federal agencies and The Weather Channel. In December, alumni Ken and Joan Austin donated $4 million to establish a residential learning program focusing on entrepreneurship. The donation also allowed the release of state monies for the renovation of Weatherford Hall, which re-opened in the fall of 2004. Senior Casey McCoy received five degrees at June’s commencement ceremonies, the first OSU student ever to earn that many degrees at one time. OSU’s Coalition of Graduate Employees successfully negotiated an agreement granting full health insurance coverage for the university’s graduate teaching and research assistants, for the first time in OSU’s history. SOL: LGBTQ+ People of Color Support Network established. In July the Multnomah County Extension Office closed after serving Portlanders since 1916. On July 31 Edward Ray became OSU’s 14th president. Ray came to OSU from Ohio State University, where he had been a faculty member and administrator for 33 years. Ray declined a formal investiture ceremony and asked that the $33,000 earmarked for that event instead go toward student financial aid. In September, construction began on a major expansion and renovation of the College of Veterinary Medicine’s Magruder Hall. Much of the expansion was for the addition of a small animal hospital and clinic, which would allow the college for the first time to provide all of the necessary training for its students. The joint program with Washington State University, in which subsidy payments were made to WSU and students had received portions of their education out of state, was to be discontinued.